The Sumbawa live on Sumbawa island in West Nusa Tenggara province. The name"Sumbawa"originally referred only to the western part of the island and the Sumbawa sultanate and the eastern part was called Bima. 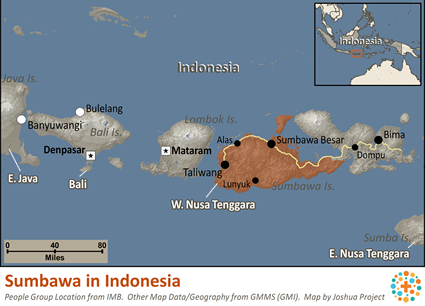 Today the whole island is called Sumbawa, although the Sumbawa people don't inhabit the whole island. The Sumbawa are spread throughout 32 subdistricts, in 2 regencies in western half of Sumbawa. 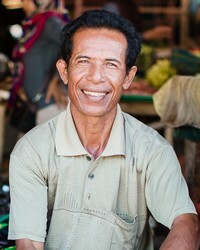 Some Sumbawa people have also moved to Lombok and other parts of Indonesia. The Sumbawa language has 4 main dialects, the Sumbawa Besar dialect being understood by all speakers, while the others are only well understood in their local areas. The Sumbawa language is related to the languages of Bali and Lombok and surprisingly quite different than the Bima language used on the eastern half of Sumbawa. Although most Sumbawa people can use Indonesian for basic conversations, most still prefer to speak Sumbawa among family and friends and for deeper conversations. Farming is the primary means of support for the Sumbawa. They work the ground in both wet rice fields and dry fields that are irrigated by rainfall. Raising water buffalo, cattle, goats and horses is another very important means of income. The Sumbawa are familiar with a system of communal work called Basiru, which is where everyone works together in the fields on a rotating basis as the field owners request workers, basically a person working in the field of a neighbour in exchange to neighbour working in his field. The Sumbawa also use a system of Saleng Tulong, where individuals help one another with various needs such as with food for a wedding or other help needed in exchange for food that will be given at a future time. The Sumbawa trace their ancestry through their fathers (patrilineal). A newly wedded couple lives with the wife's family. A father will usually be greeted using the name of his first son. The Sumbawa community is called a kampung or karang. They live in groups spread throughout the whole land area of the village, which makes it hard to tell where the village boundaries are. Some villages are bordered by a wooden fence, with a gate called a jebak. Most homes are built up off the ground. Homes of common people are called bale and homes of the upper class are called bala. Each village usually has a mosque, a village meeting hall and a rice barn. The village leader is chosen by the people and he is then inaugurated by a higher leader called a demong. The village leader and his assistant watch over the life of the village, with help from a malar, who oversees village land issues and a lebeh, who is responsible for religious activities. The lebeh is assisted by an isimesigit, a group made up of several religious administrators (rura, modum, katib and martabat) who each have their own individual responsibilities. The majority of the Sumbawa are devout Muslims, but many of them still carry out animistic practices. Many Sumbawa, although Muslim, are still dependent upon the many healers in the area, especially during times of difficulty or crisis. In 1995, over seventy-five percent of toddlers in the province received "help" from healers or people with special insights. The Sumbawa believe in many kinds of spirits and jinn including those called amar and bakek. They hold special ceremonies in order to find protection from disasters and evil spirits. They need help in improving and marketing their agricultural goods like honey, pearls and wood. Sumbawa has great tourism potential in light of their cultural wealth and beautiful natural environment. View Sumbawa in all countries. Location in Country: Nusa Tenggara Barat Province. Sumbawa island, west of the isthmus, Moyo island off northern coast.